scrap bar was a busy little bar. there was a legal limit of 74 people on one of those FDNY capacity signs behind the bar at scrap bar. this place could have half that many people on line for the bathroom alone. one night two fire marshals came in to check us on our capacity. i was at the front door as they were coming down the stairs and immediately passed the word to get people out the back door. we spoke the idle bar-chat while walking through the room and when we made it to the back of the place, security was throwing people out the front door too, telling them to take a walk around the block and come back in ten minutes. when we reached the back door, one of the marshals took a “clicker-counter” from his pocket. he said “you have almost two hundred people in this room.” and showed me the counter. it read something like 187. “well, let’s this again,” he said. we walked from the back to the front of the place. his clicker read about 120 people and he looked a bit confused. “well, just don’t get crazy in this place” one of them said as they headed up the stairs. the nice thing about a little bar like this, is that it looks as crowded with one hundred people as it does with two hundred people. now, i want to talk bathroom lines. that’s what happens when you sell lots of beer (and we sold a lot of tap beer). we were very proud of the quality and quantity of brew we served. we had a freezer behind the bar and served beer in frozen mugs. 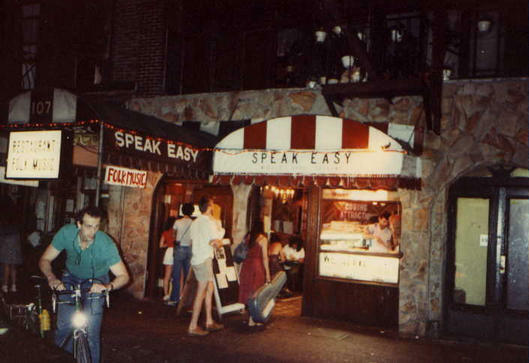 shucks – everywhere had bathroom lines – and everywhere profited by scrap bar’s success. well, there was this kid on line who just got tired of waiting and leaned himself between the wall and the street-fighter game – or was it tetris? – across from the bathroom doors, (so he was real close) and began the pee – in the lair of the starriders. the starriders rode motorcycles, drank beer and smoked weed. they made the back of scrap bar their home. in a short second, someone said “hey,…” and the next thing you know this kid’s getting pounded while peeing. when the smoke cleared, he was explaining that he was axl’s brother and that somehow gave him pee-anywhere-license. he was drunk but not obnoxious, except for the pee-anywhere thing. he really was axl rose’s younger half-brother (or fraction thereof). axl’s fractional brother’s name was stuart bailey. i think he was also a rocker-dude and had a band, though he would not become a big shot who takes twenty years to release an album. i hope he’s well. he was a nice kid. a member of the starriders, john, mentioned the incident in an e-mail a few days back. thanks john. hi eddie and the rest of the guys! !